From Imphal to Junagarh and Cooch Behar to Calicut, this barely sums up the Prime Minister Narendra Modi's superhuman Election 2019 schedule. New Delhi: With the charge of leading the BJP to another victory, manning the nation round the clock and upholding the global presence India has assumed in the past five years, PM Narendra Modi has covered 22,000 km across 13 states and 23 rallies during his 9-day Navratra fasting and kept his diplomatic appointments too. From Imphal to Junagarh and from Cooch Behar to Calicut, this just barely sums up the Prime Minister's schedule this Navratra. While the PM is known to keep a non-stop hectic schedule all through his tenure, he was doing all this in simmering heat when the thermometer often jumped to 40°C. 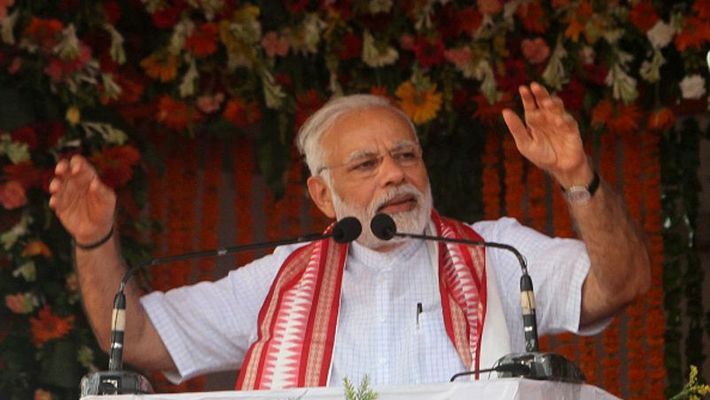 In the past few days of Navratra, Prime Minister Modi has addressed massive public rallies across Odisha, Chhattisgarh, Bengal, Tripura, Manipur, Maharashtra, Karnataka, Tamil Nadu, Gujarat, Goa, Bihar, Assam and Kerala. While practically he is the only star campaigner on the back of whom the BJP is riding for another five-year stint in power, which will be a record in the history of Indian democracy, matters of the state cannot wait. They demand his immediate attention. Therefore, the PM returns to Delhi after a full day’s campaign of three to four rallies and very often straightaway goes into crucial meetings, which stretch into the wee hours. Sources close to the Prime Minister told MyNation that he plunges into the electoral campaign just after a short nap. And amid all this, Modi has kept his global associates and his diplomatic engagements in mind too. Keeping himself abreast with developments across the world, the Prime Minister congratulated the leadership in the Maldives, over the phone, for the successful election results. He congratulated Israeli Prime Minister Benjamin Netanyahu on his re-election. He thanked President Vladimir Putin and the people of Russia too — for conferring on him the Order of St. Andrew the Apostle, their highest national award. The Prime Minister has kept his date with the media too. He made time for interactions with four media groups in the same Navratra period.